So, at all of these fine establishments, I've sat and drank coffee and poured over garden plan books, and I just hadn't found anything worth taking home. I was learning a few things here and there, but I was also discovering that my caffeine tolerance was heightened while reading garden plan books. Yes, caffeine had almost no effect on me whehn reading the very academic discourse on the concepts of design and geometric theories that influence garden layout/arrangements. I know there is an art to all of this and that professionals spend a lifetime immersed in those theories to produce award winning garden designs. But I don't want an award winning garden design. And I don't want to be caught sleeping in the Barnes and Noble. I do want a garden that looks good. Something that is planned and intentional. Something that makes my neighbors feel good when they glance out their window while they drink their coffee and read the morning paper. Something that makes the mailwoman smile when she walks up my sidewalk to drop letters by my front door. Something that relaxes me when I look out my office window. So, I needed a plan. I'm figuring out Sketchup for building my plan, but I needed some help on figuring out what to put in my plan. And then I found Jeni Webber's Front Yard Idea Book at the Book Exchange for a whopping $10. Okay, the Handyman found it. 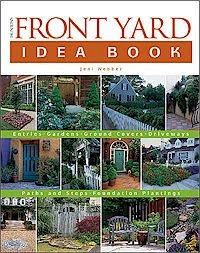 The Front Yard Idea Book is published by Taunton, who also publishes the Handyman's favorite periodicals: Fine Woodworking and Fine Homebuilding. The best thing that Webber' book has going for it is it's organization. Well, and photos. I'm a sucker for a pretty pictures. But, the organization is delightfully geared for someone with a limited attention span. Each section addresses a different element commonly used in front yards: paths and steps, ground covers, lighting, driveways and parking, etc. It's easy to pick and choose the elements most pertinent to my project. I think the most useful chapter for me so far has been the one on foundation plantings. After checking out the photographs in that section, I realized that my house is a lady without a skirt. The foundation is exposed, and while it's not unsightly on it's own, there's potential for great improvement. Weber gives advice based on several architectural and cultural cues, and there are short checklists to help influence the selection of plants based on their size, shape and texture. While I know that paying a professional would produce results leagues beyond what I can do on my own, I'm excited to jump into this. There's something adventurous about attempting to take out all or most of one's lawn, and I think I'll be referencing Weber every step of the way. But, I'm, by no means, a one-book-woman. If there are more to check out, let me know. The more ideas the better! Awesome! And bravo for using your community resources. I'm all about hanging out in bookstores and using the library. Hope your week is going great! Thanks for the tips. I definitely need some help with my garden photos, so I'll be checking out that site, and will also look for that book at the library. I just checked out "Lasagna Gardening" which I really like. Great for some "low labor" garden planning ideas.